Episcopal Community Services operates shelters for homeless adults at two year-round programs, The Sanctuary and Next Door, and the Interfaith Winter Shelter sponsored by the San Francisco Interfaith Council which operates November through March. 4600 individuals, families, seniors and veterans receive shelter services from ECS annually. Each night at the Sanctuary and Next Door individuals receive hot meals, showers, have access to laundry facilities and clean, warm beds, and an array of social services and healthcare opportunities. San Francisco Shelter Reservation Centers serve as the point of entry to shelters for single adults. They coordinate bed assignments throughout the city to maximize the utilization of space. An individual needs to physically go to one of these centers to get a reservation. The reservations fill up quickly and the shelters generally cannot admit anyone without one. Both The Sanctuary and Next Door follow a client-focused Harm Reduction Modality. All of the participants are referred to these shelters through the Resource Centers listed above. Once in the shelter, participants are encouraged to participate in our case management programs. Since 1988, the San Francisco Interfaith Council (SFIC), Episcopal Community Services (ECS) and the current Department of Homelessness and Supportive Housing (HSH) have partnered to operate the San Francisco Interfaith Winter Shelter. 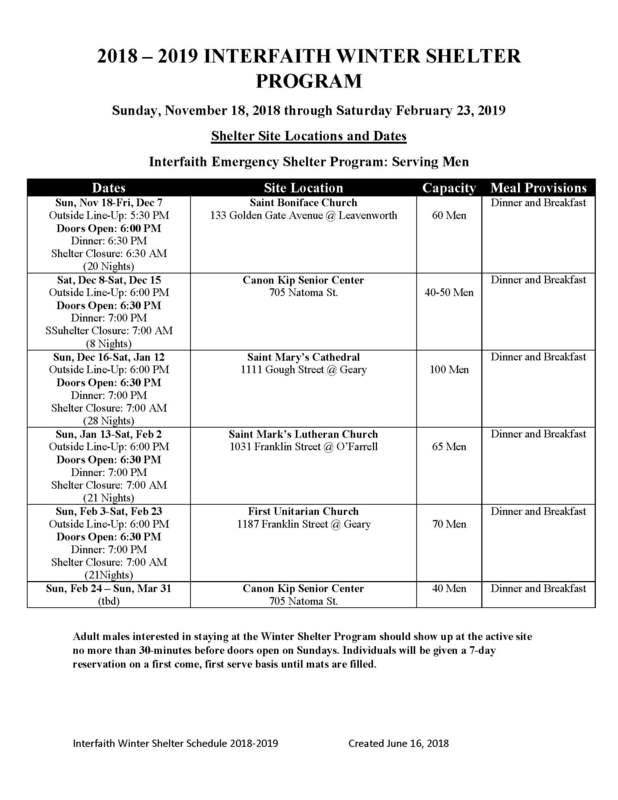 Designed to augment existing shelter opportunities during the coldest months of the year (Sunday before Thanksgiving through the end of February), the Interfaith Winter Shelter provides breakfast, dinner, and a safe and warm overnight rest for up to 100 homeless men each night. Where is the Interfaith Winter Shelter? The Interfaith Winter Shelter is hosted by four congregations - St. Boniface Catholic Church, St. Mary's Cathedral, St. Mark's Lutheran Church, and First Unitarian Universalist Society, with ECS' Canon Kip Senior Center supplementing additional dates. Each year, a large effort takes place in networking with local faith communities to open their spaces and their hearts. 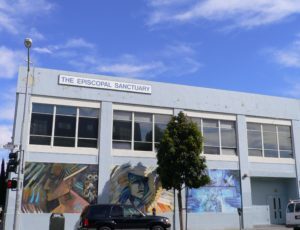 The Sanctuary (201 Eighth Street), formerly The Episcopal Sanctuary, provides emergency shelter to homeless adults who register through the City of San Francisco. The Sanctuary is a 24-hour facility and provides two meals a day to shelter residents. ECS collaborates with the nursing school of San Francisco State University and SFSU nursing students and faculty offer drop-in clinic hours for Sanctuary residents three days a week. 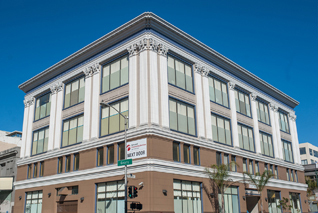 ECS's behavioral health team, known as SF START, also provides behavioral health services for residents at The Sanctuary and other San Francisco shelters. Many Sanctuary clients are homeless seniors. Seniors have designated shelter beds and earlier access in order to provide extra time and space for evening preparations. Homeless seniors often have chronic medical conditions, such as diabetes, and the Sanctuary works to accommodate their nutritional needs in the breakfast and dinner meals. During the day, homeless seniors can enjoy programs and a hot lunch at the ECS Senior Center. Next Door includes beds reserved for veterans and persons awaiting admission to community-based treatment programs. Many of those who stay at Next Door are addressing substance abuse problems, and some are coping with mental health issues and chronic medical conditions. Despite challenges, many shelter residents are able to move into housing as affordable units or other options such as residential treatment become available. ECS staffs the San Francisco Shelters Treatment Access and Resource Team (SF-START) with behavioral health specialists who serve ECS’s two year-round shelters and three other city shelters. Our clinicians provide shelter clients with coordinated and integrated services to support recovery. SF-START serves homeless male, female, and transgender adults, 18 years and older, who present with moderate to severe behavioral health issues including psychiatric, substance abuse, and co-occurring chronic medical conditions. Our staff strives to provide individually tailored harm reduction services that assist clients in identifying risky behaviors so that, in partnership with the client, we can pursue behavioral stabilization and care plans designed to reduce the frequency and harm associated with the behavior. Services include: outreach, assessments, client goal-setting, counseling, case management, referrals, crisis intervention, and benefits advocacy.